The UK has 35 entries shortlisted across this year's Outdoor Lions category at Cannes. 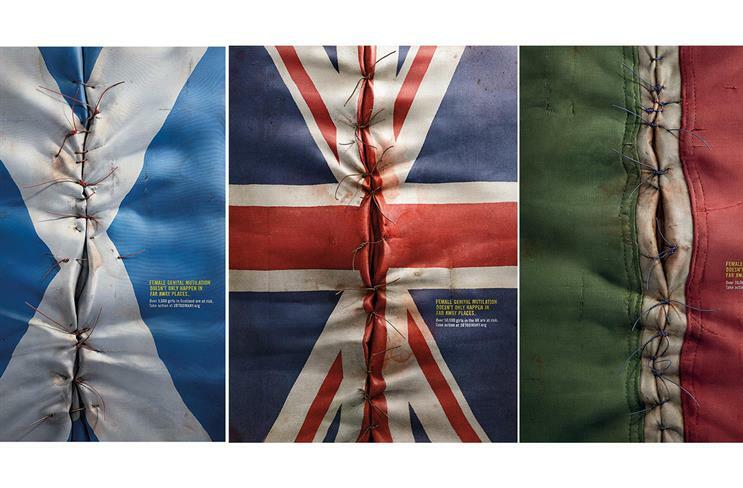 Ogilvy & Mather London leads the way with 12 entries for the charity 28 Too Many. Last month it released the 'It Happens here' print and outdoor campaign, which explains female genital mutilation is an issue that affects people in the UK and across Europe. Grey London has been shortlisted seven times, with three entries for work for The Sunday Times, three for work for Duracell, and one nod to Volvo UK’s "life paint" effort. Adam & Eve/DDB was shortlisted six times for its work for Harvey Nichols’ Spring/Summer Sale 14. Last year, A&E/DDB received nine gold Lions – six for Harvey Nichols and three for Marmite – in the Outdoor category. Publicis London has five entries in the category this year, all for homelessness charity Depaul UK’s "there’s another side to the story – never in a million years" campaign. Other UK agencies in the running include J Walter Thompson London, Fold7 London, WCRS London, BBH London, and PHD London. Brazil had the most shortlisted entries in the category, with 77 entries. US-based agencies were shortlisted 64 times. Winners will be announced tomorrow (23 June).